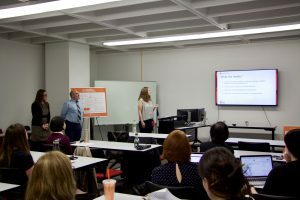 On October 26th, faculty members at the University Libraries presented on topics in open access, open data, and open educational resources as part of the Libraries’ programming in observance of Open Access Week. These lightning talks addressed topical issues in open access. Jamie Saragossi, Jessica Koos, and Gregg Stevens highlighted key resources for public health communication. 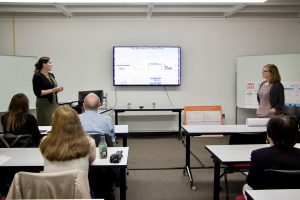 Mona Ramonetti and Jin Guo discussed the ways in which open educational resources can be used to increase accessibility to college coursework. 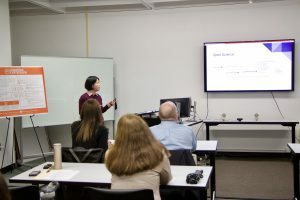 Claudia McGivney and Jennifer DeVito engaged with open data for business research, while Clara Tran presented on the use of bibliometrics to assess and understand scholarly output. Please join us on November 16th for the final installment in our Fall 2017 University Libraries Colloquium Series. More information and registration here.